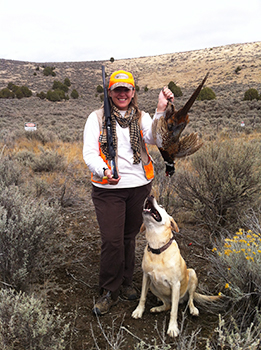 A DWR employee shares the story of how she became a hunter. I’m a Mississippi girl who grew up in a hunting family. My daddy hunts, my uncles, cousins and grandfather all hunted — pretty much my entire family hunts, but I never had the desire to kill beautiful, wild creatures. I always thought of hunting as something folks did just to shoot something, or to get big mounts up on their walls. This way of thinking followed me all through high school and college. I was happy being a wildlife watcher. I didn’t care to understand hunting. My opinions took a major turn last year when I became involved with the Division of Wildlife Resources’ Hunter Ed Plus Program. The Hunter Ed Plus Program is a two-day mentored shotgun shooting clinic and upland game hunt offered to new hunter education graduates. I was tasked with scheduling mentors and participants for the shotgun clinics and upland game hunts. It was these upland game hunts that would spark my curiosity about hunting. I tagged along and watched the excitement and pride on new hunters’ faces as they harvested their first pheasants. I watched mentors work their dogs through the fields and point or flush birds. My heart raced each time a bird flew by, even though I wasn’t even hunting! It was a lot of fun to see the mentors passing along hunting traditions and knowledge as the kids absorbed the lessons. Several weeks after my experience with the Hunter Ed Plus upland game hunts, I had the opportunity to go on my first pheasant hunt in Illinois. I spent a week learning about hunting, fishing and trapping and I practiced my shooting techniques on the shotgun range. Tricia took down this bird with her first shot. This hunt got her hooked for life. Though I learned a lot about hunting, I was a horrible shot. I think I shot for about an hour and only hit three clays. That would all change on the day of my hunt. Two flushing dogs, a guide, two mentors and one other new hunter accompanied me on my first hunting adventure. As our little cocker spaniel made her way through the field, she “got birdie,” as the guide called it, and all of a sudden, a big rooster flew out right in front of me. All of my training and practice kicked in and I took the bird down with my first shot. I was so proud! My mentor was jumping up and down screaming “nice shot, nice shot!” It was so much fun. That was the first of two roosters I shot that day. Even with all of the excitement of pheasant hunting, I didn’t really understand what hunting meant to me until my first big game hunt. 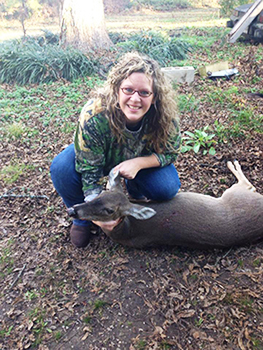 I went back to Mississippi in November to take part in my first white-tailed deer hunt. I’m fortunate to have a great mentor in my daddy. He’s been a hunter all my life and knows a thing or two. My childhood home has about 32 private acres of perfect white-tailed habitat. On the day before the hunt, my daddy and I went back to set up our ground blind on a high hill, just above a small gorge. Everything was ready. The next day, using my daddy’s gear, I made my way back to the spot. It was mid-afternoon and the wind was in my face. According to daddy, this gave me the edge I needed, as the deer wouldn’t pick up on my scent. I sat in the blind for about 30 minutes and then I saw something moving through the trees. My heart was pumping! There were several does heading my way. I was so nervous, I froze. All I could do was watch them walk by. All of a sudden they ran and I knew I had missed my chance. Of course, my daddy and husband made fun of me for choking under pressure. I hunted for seven days during that trip and never saw another deer. This hunting disappointment prompted my daddy to fly me back to Mississippi in December for my second deer-hunting attempt. That trip was much different. I had the flu and was getting over a horrible cough. Once I was feeling better, I decided to go back in the woods just to scope things out. I think I sat in the blind for about 20 minutes before I saw deer coming my way. My daddy had just killed an eight-point buck a few days earlier, so as the doe moved closer to me, I looked to see if a buck might be following. No such luck. Three doe stood in front of me; one was much bigger than the others. I decided to focus my efforts on her. I took a deep breath and shot. By that point, I was so amped up that I ran down to where I shot her and looked for a blood trail. After all, that’s what my training said I should do. I looked around for about two seconds and then decided to get my daddy to help me track her. Wouldn’t you know it, she was about 10 feet from where I shot her! My daddy just giggled. In all of my excitement, I barely looked to see where she might be. Tricia's first successful big game hunt. She wasn’t a huge deer, but to me she was a trophy. I cherish the memories I am making with my daddy and the knowledge he’s passing along to me. This is something no words could ever describe. During the hunt and after the kill, I went through many unexpected emotions. I watched squirrels run up and down the trees and bark at each other, not knowing I was there. I watched birds forage and heard them sing. It was wonderful to be hidden in nature. It solidified my love for the natural world and for wildlife. I also felt exhilaration, sorrow and gratitude: excited after I killed the deer, sadness for taking her life, and appreciation for her life and the meat I now had to feed my family. I wanted to use as much of the deer as possible. To have so much love and appreciation for wildlife, and then to hunt that same wildlife, really opened my eyes to the whole concept. It seems as though we only ever hear about the poachers who steal wildlife and we never really get to hear about how connected a hunter can feel to nature and the wildlife they pursue. It’s great to step into the shoes of the hunter I once judged and to see things from a different perspective. I am now a lover of wildlife and respective hunter of that wildlife. I’m currently planning my next big hunt: TURKEY in May 2013. Gobble, gobble! I simply cannot imagine how any person could aim a gun at an innocent creature who cannot defend themselves and gun them down in cold blood. It just makes my soul ache. So so sad. Lima, are you a vegetarian? Do you avoid wearing leather shoes? If so, I respect your opinion. If not, can you see the hypocrisy in your statement? wow, I dont know how a vegan came to post to a hunting page, but whatever. I think moccasins are excellent hunting shoes, they let you move quietly. Now these arent moccasins, just similar. Theyre actually for fashion, but I think they could do pretty well bird hunting.